Almost ten months ago, Head Coach Grant Mollring set the new standard for Buena Vista University’s football program, “Win the IIAC.” With that, he also asked his nine to-be senior football players to step up and lead the team to their ultimate goal. Ten months later, the vision never became a reality for the graduating nine. However, their contributions to a growing program won’t be forgotten. The Buena Vista Football team held their Senior Day ceremonies on Saturday, Nov. 10, as they finished their season against the Simpson Storm. After a hard a hard fought loss, the senior Beavers hung up their jerseys for the last time in their collegiate careers. Cole Miller, Colton Preston, Marque Edwards, Quamaree Harris, Charlie Flickinger, Wesley Brennan, Matthew Yngve, Sean Joelson and Collin Demoreuille first came to BVU in the fall of 2015, in what seems like just months ago for them. From 110-yard sprints to team outings at La Juanita’s. Six in the morning lifting sessions to a Sunday reward swim at King’s Pointe waterpark. The grind of fall camp to All-Conference accolades. Heartbreaking losses to underdog wins. An overtime, walk-off two-point conversion against the Dutch on Hall of Fame Day. The nine have been reminiscent of the rollercoaster ride their four years have been. Cole Miller, a record-setting quarterback for Buena Vista, finishes his career 2nd all-time at BV in passing touchdowns and total yards. He completed the season with a substantial 2,432 all-purpose yards as well and was appreciative to be recognized as one of the all-time BVU greats. As co-captain of the team, both Miller and fellow co-captain Collin Demoreuille were honored to represent the team and set the squad’s high standards. “It’s something that I’ll always remember for sure. Senior year, record-wise, wasn’t what we wanted but we made a lot of great memories. Being able to be that leader and be that face was a great time. 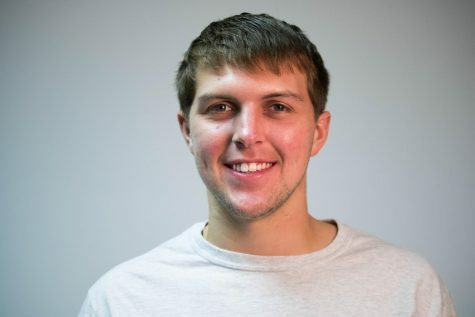 I was able to represent BVU the best way I could,” says Demoreuille. Though five of the seniors were starters on offense, none had a better connection than Miller and Flickinger. Growing up together and playing in high school, the duo developed a lasting friendship through football. Flickinger, a receiver for the Beavers, ended the year with two touchdowns and 227 yards. His ability to joke around with Miller, and also bring each other back to Earth at times, has proved beneficial. “I think we can tell what each other are thinking really well. There’s times that I can just go to a window because I know that’s where Cole is going to throw the ball. For however many years now that’s just the way it’s been,” says Flickinger. However, Joelson and Preston can also be seen laughing and having fun together as a pair all over campus. Preston, a four-year lineman for the Beavers and Joelson, the team’s newest addition in his senior year, proved a force to be reckoned with in the trenches. One of the offense’s most versatile players, Matt Yngve, split reps this year at both the tight end and fullback positions. While having to know the playbook as much as anyone on the team, Yngve also relished his time in the weight room. Brennan, Edwards, and Harris, the trio of defensive lineman dedicated to stopping anything opposing offenses threw at them, came from different walks of life. However, through their shared experiences and their love of the game, they developed an unbreakable bond. Brennan, an RA, football player, former president of an on-campus club, and All-Conference Academic recipient, had great advice for any aspiring collegiate athlete. Harris, a native of Las Vegas, hasn’t adjusted to the life of Iowa quite the way he expected. The cold weather in particular has come as a surprise to him, but he’s still made lasting memories at BV. Edwards, a physical powerhouse on the line for Buena Vista, took pride in his play and ability to move the offensive line. “Especially at nose guard there’s always bigger lineman that you’re going against, especially in this conference. Being physical in the trenches, especially as nose guard, is a big factor in that,” says Edwards. 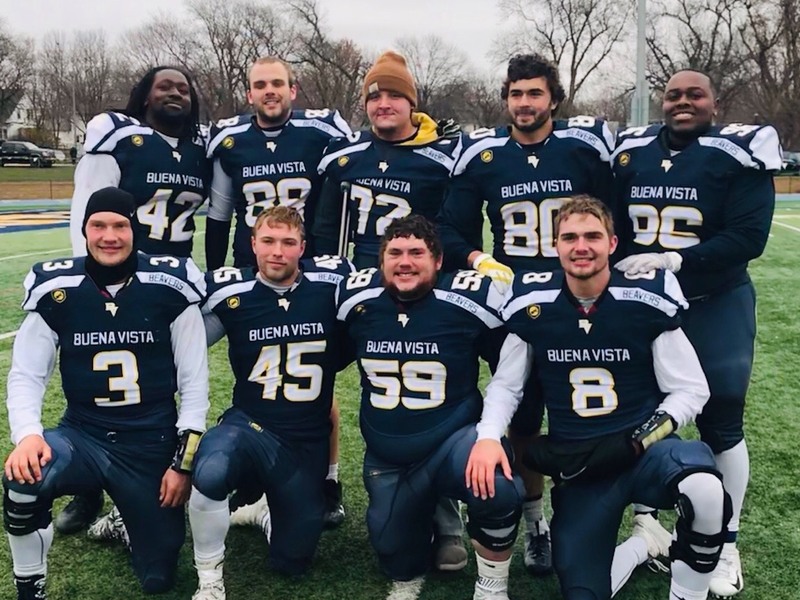 As the nine seniors look back on their time as Buena Vista University football players, there’s an air of melancholy. Reminiscing on both the positives and negatives will happen naturally, but the nine will never forget some of the best moments of their lives spent as a Beaver.